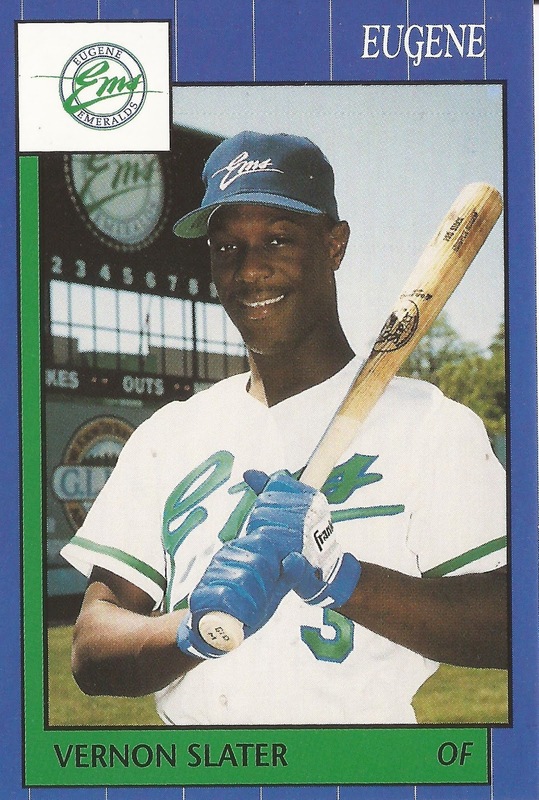 The Eugene Emeralds opened the 1990 season on a tough note, but outfielder Vernon Slater preferred to look ahead, according to The Eugene Register-Guard. "It's the first game of a lot of games," Slater told The Register-Guard after the 10-3 loss. "It's no big deal. But we do have to play better." Slater went 1 for 3 in that game, his professional debut. He had a few more games to play himself after that. He played that season and the next. He also played parts of two seasons in independent ball, but he never made AA. Slater has since gone on to participate in a lot more games - as a coach in high school. Slater's pro career began that year in 1990, taken by the Royals in the 23rd round of the draft out of Polk State College in Florida. He also graduated from Brandon High School there. He was also credited as Vern Slater. At Polk State, Slater won second-team all-state honors. He then started his pro career with the Royals at short-season Eugene. Slater hit .190 in 53 games for Eugene that year. He also hit four home runs. He played 15 games at single-A Appleton the next year and played the remainder of the campaign back at Eugene. He hit .194 overall. That season marked his last with the Royals. He returned to the field briefly in 1994 and 1995 with independent Mason City and independent Sullivan to end his career. Slater soon returned home to Florida and became a coach. By 2006, he was coaching at Middleton High School. In 2012, as his team played through another tough stretch, he continued to talk about playing better. "Our guys are young, and they have to start. We're killing ourselves with a lot of mistakes all over the ballpark," Slater told Patch that March. "We can't compete when we play like that; it's the reason we're losing."